A reminder to be there by 7 am. Remember Ash will be closed, so getting to the corner of Broadway and Nettleton may be a little tough. Show up and get a free t-shirt and a quarter of a point and be a part of the fun! I would like to thank each of you for the generosity and outpouring of support you have shown my wife and I after my recent accident. On Thursday, April 17th, my right calf received second and third degree burns while I was operating on the scene of a shop fire in northern Spokane County. I stepped off a boat trailer and some cross members of the trailer that were hidden by burning debris lifted my pant leg up. My right boot was instantaneously filled with hot debris. My fellow members of District 9 provided initial care and treatment to my wound while I waited on scene for an ambulance. After arriving at Sacred Heart Medical Center, I was quickly informed that the hospitals in Spokane were not equipped to deal with my injury. The physician informed me that I would soon be on my way to Harbor View Medical Center in Seattle. A short jet ride later, I was landing at Boeing Field. The care I received at Harbor View was more incredible than I ever could have possibly imagined. The men and women I came into contact with throughout the hospital were extremely kind, compassionate, and professional. I especially appreciate the individuals I dealt with during my brief stay on one of the burn floors. I had the opportunity to see a number of other individuals that had received burns much more severe than mine during my time on the floor. I got a chance to see individuals that are going to live with the scars and devastation most of us hope we will never know. My surgeon operated on me Monday, April 21st. I was released from the hospital a day later. Monday, April 28th, I flew back over to Seattle for my first follow up appointment. The surgeon was extremely happy with how I was healing up. Aprox. ½ to ¾‘s of the my right calf had received second and third degree burns. The surgeon opted to graft everything in the hopes that my injury will be less noticeable when things heal. I was informed at my first follow up that the doctor would be requiring me to do follow up visits every two to three weeks for up to a one year. I believe they continue to be worried about infection, how well the graft is taking, and a whole host of other things. All in all it hasn’t been too painful of an experience. The mot pain I have had has been a result of my maiden voyage into the world of catheters. If you haven’t yet had the pleasure, I would recommend that you do everything in your power to ensure that you don’t have to ever get one. I also highly recommend the phentonayl (s.p.) suckers. When my wound was being cleaned up, the nurses provided me with one. The feeling they provided was so great that I wanted to bring some back for any of you that would like to have a sample. However, since they are kept under tight lock and key, if you want to experience “the magic,” I guess you are just going to have to have your own injury. On a serious note, I greatly appreciate the financial support you have provided. As you can imagine, the expenses incurred during my treatment and subsequent trips to Seattle has become very costly. I expect at least a portion of those costs will be covered by L & I and I am currently attempting to work with them to find out where things stand. The support you have provided will go a long way towards helping cover current expenses and costs as well as future expenses that aren’t covered. As some of you know, I had the opportunity while growing up to spend a fair amount of time around the Spokane Fire Department. One of your comrades is the reason I decided to go into the fire service. As I continued to get older, I spent time around some the stations asking questions and continuing to be fascinated by the idea that maybe one day I too would get to work on a department. While my journey never created the opportunity to work directly alongside each of you, I continue to have a tremendous amount of respect for your organization. I still know a number of individuals working throughout the city and I believe they are some of the finest individuals I have ever had the pleasure of knowing. Thank you so much for the generosity and help you have provided. Todd Chism will be holding a news conference May 1st at 11:00 a.m. at 618 West Riverside. Todd would like to have as many people as possible there to show support for him. If you can make it , please be there. Hopefully, the nightmare has now ended for Todd and his family. It is sad to think that, in today's climate, this could happen to anybody at anytime. If Todd wasn't such an intelligent, tenacious, well-respected, and all-around good guy, I wonder how this would have ended. The State Patrol is going to give a press conference today. That should be interesting. Congratulations Todd. We all look forward to seeing you back at work! NARRATIVE: On the afternoon of April 28th at 3:45 pm The City of Spokane Fire department responded to a reported structure fire at 1220 East Pacific. Smoke could be seen from a ½ mile away by the first responding companies. Upon arrival the first apparatus reported heavy black smoke and flames showing from a 1st wood frame house. Fire from the fully involved house was impinging on the house to the east. Fire attack leads were advanced to the interior and to cover the exposure to the east. Roof ventilation was completed and a search was conducted. No one was found inside. It took about 20 minutes to extinguish the main body of the fire and 3 hours to complete overhaul and final extinguishment. The house and contents were total loss. Red Cross was called to assist 5 adults who were displaced. No injuries to report. The cause of the fire was determined to be an accidental. DAMAGE EXTENT: House and contents total loss. NARRATIVE: The Spokane City Fire Dept. responded fire fighting apparatus to 2614 E Euclid at 1:31 in the afternoon on Sunday, April 27th, for a reported structure fire. The first arriving fire crew reported light gray smoke issuing from the roof vents of a single story wood/frame dwelling. As other apparatus and crews arrived on scene they immediately forced entry into the structure to simultaneously search the dwelling for occupants and endeavor to locate the source of the smoke still coming from the roof vents. A primary and a secondary search of the house revealed no one in the home, and the investigation into the cause of the smoke found smoldering blown-in cellulose insulation in the attic space. The ceilings in some of the rooms were pulled down and they revealed that this smoldering fire had completely burnt through 2 or 3 of the roof trusses at the ceiling and that 2-3 more of the trusses had been seriously damaged. Crews remained at the scene for more than an hour as they worked to remove the still smoking insulation to the outside of the structure where it could be completely extinguished. There were no reported injuries to any of the firefighters. The cause of this fire is being investigated by the Special Investigation Unit of the Spokane City Fire Dept. The damage to the house was confined to the attic space, the roof trusses, and of course the ceilings in the rooms where the sheetrock had to be removed. DAMAGE EXTENT: The attic space, several of the roof trusses, living areas where sheetrock on the ceilings were pulled down. 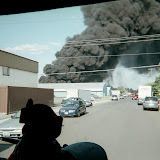 NARRATIVE: On Sunday, April 27, 2008 at 4:21 AM, 6 Companies of Spokane Firefighters, 3 Engines, 1 Heavy Rescue, 1 Pumper/Ladder and 1 Senior Ladders under the direction of Battalion Chief Dan Brown responded to an unknown type structure fire at 1923 West Shannon Avenue. Firefighters were initially dispatched to a large amount of smoke and fire coming from behind the address. While enroute, the first-due company upgraded the alarm to a working fire due to the close proximity of the adjoining addresses to the incident and large amount of fire showing on arrival. To access the fire, the first two companies had to force gates and remove a privacy fence to obtain entry to the fire's location. They encountered a single story garage at the rear of the address with live utility (Avista) wires down and arcing. There was an intense fire that had consumed the majority of the structure and was impinging on a neighbor's home. It took 21 Firefighters just 30 minutes to knock down the fire and control the incident. Firefighters were able to limit the spread of fire to the building of origin and limit additional damage to the adjoining homes and property. No civilians or firefighters were injured as a result of the incident. PROBABLE CAUSE: The cause of this incident is under investigation by the SFD's Special Investigation Unit (SIU). The incident has been determined to be incendiary. More information regarding the investigation will be released when available. DAMAGE EXTENT: The garage and contents are a total loss. Adjacent property received limited damage.